Learn how to design and develop distributed web services in Java, using RESTful architectural principles and the JAX-RS 2.0 specification in Java EE 7. By focusing on implementation rather than theory, this hands-on reference demonstrates how easy it is to get started with services based on the REST architecture. 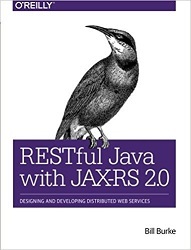 With the book's technical guide, you'll learn how REST and JAX-RS work and when to use them. The RESTEasy workbook that follows provides step-by-step instructions for installing, configuring, and running several working JAX-RS examples, using the JBoss RESTEasy implementation of JAX-RS 2.0. Bill Burke is a Fellow at the JBoss division of REd Hat Inc. A long time JBoss contributor and architect, his current project is RESTEasy, RESTful Web Services for Java.